Explain why a gap exists on either side of the toilet compartment door in traditional restroom partition systems, and how the new hinge and post system eliminates those unsettling gaps and improves the privacy provided to occupants in the bathroom stall. Choose a material for the toilet compartment that is naturally resistant to the mold, mildew, rust, and bacteria that can occur in the damp bathroom environment. Describe the many sustainable design features of the high-density polyethylene (HDPE) toilet compartment, including its fully recyclable nature, ability to contain recycled content, and zero emissions rating. Specify HDPE hinge and post systems to create a high-privacy toilet compartment. The typical specification for the standard commercial toilet compartment in the United States does not leave much to the imagination—but not in the way that one might think. Yes, it is straightforward. 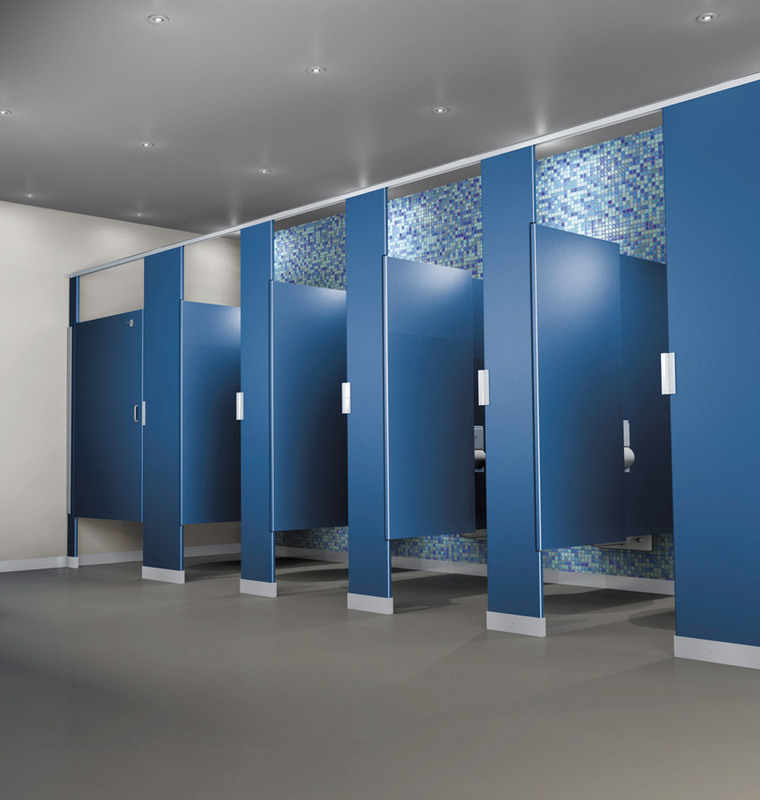 The common pilaster system comprised of pilasters, dividing panels, doors, and hinges has not changed much in the past few decades, but, most surprisingly, neither have the gaping sightlines that offer more than a glimpse into and out of an occupied restroom stall. The new hinge and post toilet compartment eliminates those unsettling sightlines and creates a high-privacy occupant experience in a public bathroom stall. Luckily, designers now have a solution that will leave people feeling less exposed. A new toilet compartment system, called the hinge and post bathroom system, has been developed to provide more privacy in this most private space. 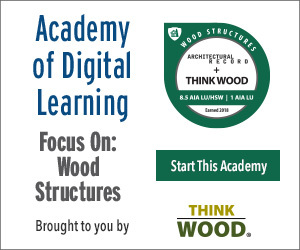 This course will explore the semi-private nature of the typical pilaster system, introduce the new hinge and post bathroom compartment system, and detail the features that make this solution a superior privacy option. The aesthetics of the two systems will also be compared, as will their support of sustainable design tenets. Finally, best practices for specifying the new hinge and post system will be shared. The design of the pilaster toilet compartment commonly used in the United States is based upon flat rectangular columns, called pilasters. The pilasters are secured to the floor or ceiling, creating the basic frame for the entire bathroom stall structure. The individual compartments are crafted by mounting the doors and dividing panels to the pilasters with exposed metal hinges. The pilaster toilet compartment commonly used in the United States is based upon flat, rectangular columns called pilasters. In terms of assembly, the specification for the pilaster-based toilet compartment provides some guidance on how the various components must be cobbled together. The standard spec directs installers to “locate the bottom edge of doors and panels 14 inches above finished floor” and “provide uniform, maximum 3/8-inch vertical clearance at doors.” While the included tips are certainly relevant to fashioning a functional and code-compliant toilet compartment, there seems to be one glaring omission. The standard toilet compartment specification does not define the size deemed acceptable for the gap that is created on either side of the stall door where the hinge or latch fastens the door to the adjacent pilaster. The gap, or how to avoid it, is not mentioned at all. Unfortunately, the gap in a pilaster-style bathroom compartment is a function (and flaw) of the system’s design. The flat, rectangular column anchors a flat, rectangular door as it swings open and shut on a heavy-duty hinge. The problem arises because space must be provided to allow these rigid and straight-edged elements to accommodate a rotation of almost 90 degrees without causing the door to stick. Providing enough space so that the door can move freely creates gaps between the door and the pilasters on either side. The typical gap in a well-constructed, pilaster-based toilet compartment is 3/16 inch, which is large enough to create a substantial sightline into and out of the bathroom stall. Installation errors and poor assembly practices can result in much larger openings at the door, leaving people extremely exposed and uncomfortable. While gaps in the toilet compartment may be considered business as usual in the United States, travelers from abroad are often horrified to find that the design of our bathroom stalls turns every trip to the restroom into an unsolicited peep show. In fact, there is an entire BuzzFeed thread dedicated to the topic of toilet door gaps in America. For years, specifiers in Europe and China have rejected American-made partitions and toilet compartments because of their somewhat exhibitionist nature, opting, instead, for compartments that provide a more complete visual barrier and greater degree of privacy. In conversations with large partition dealers in China, it was explained that United States pilaster-based partitions were not an acceptable product option for their specification community due to the lack of privacy they provided. However, even Americans are becoming wary of their potential exposure while on the pot. With smart phones now equipping every bathroom occupant with camera and video-recording capabilities, and the means to distribute those images worldwide, the demand to improve the privacy of the bathroom compartment has now reached our shores. 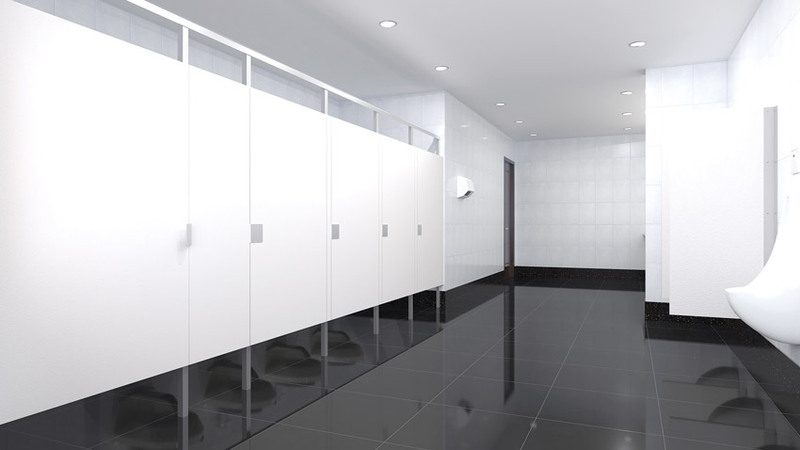 To answer this call, specifiers need a toilet compartment solution without those unsettling sightlines and with doors and partitions that can sit closer to the floor. They need the new hinge and post toilet compartment.